Blogger and analyst Brian Madden’s annual virtualization geekfest returns to Europe next week (10-11 May) at the Chelsea Football Club in London, and as with all community events, AppSense is proud to be an event sponsor along with Citrix and Intel. The AppSense team will be turning out in a big way to take in and contribute to the jam-packed agenda of great virtualization community content. We’ll dive right into the deep end on Tuesday as AppSense’s Benny Tritsch will put his independent community hat on (not AppSense hat) and join respected independent consultant Shawn Bass to reprise their popular session “RDP, RemoteFX, ICA/HDX, EOP and PCoIP VDI: Remoting Protocols Turned Inside Out.” If the past is any indication, this will likely be one of the most attended and discussed sessions at the event as two of the sharpest guys in the space drill into how graphics and media remoting works and do a head-to-head comparison of the most popular protocols. Later on Tuesday, our newly appointed VP and CTO Harry Labana and Brian Madden will team up for the other must-see session of the day, “The Future Desktop: What Should it Do and What Should it Look Like?” There is no shortage of new desktop and application delivery approaches these days, and there are even more views and opinions on what is on offer and what best suits specific use cases. Wondering where is it all going and to what degree will IT teams be able to rise to the occasion? You can bet that Harry and Brian will each have some insightful and provocative perspectives, and that neither will hold back from speaking their mind. 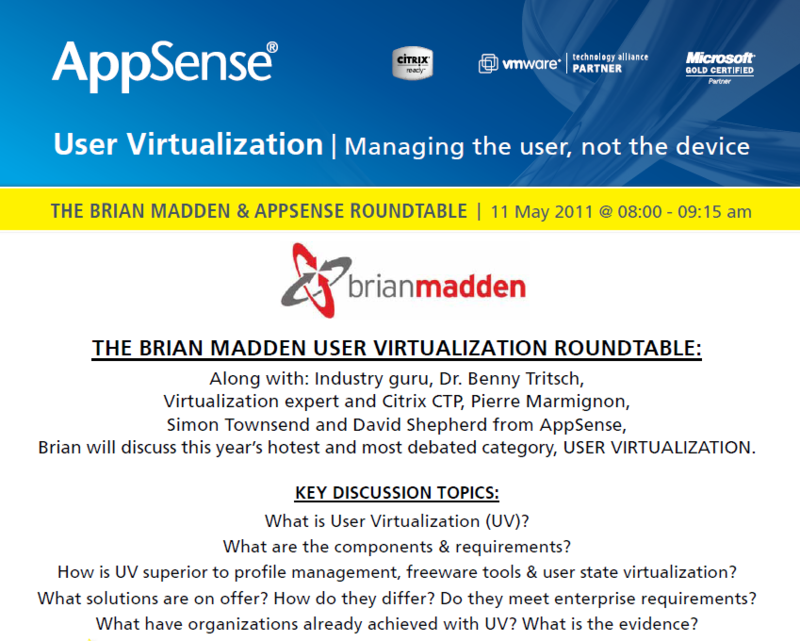 On Wednesday, Brian will join AppSense technical minds Benny Tritsch, Simon Townsend, and David Shepherd, as well as highly respected Citrix CTP Pierre Marmignon, owner of www.CitrixTools.net and the free (and controversial) Virtual User Environment Manager solution, for a roundtable discussion on the state of User Virtualization. This all-star group will cover the key elements of User Virtualization, the types of solutions available, and how it is being applied in practice today. AppSense’s Jon Wallace, like Benny Tritsch, will be wearing his non-AppSense, independent hat when he delivers his session “Mandatory and Default User Profile Tuning.” A recognized expert on the Windows registry and user profile architecture and author of www.InsideTheRegistry.com, Jon will demonstrate a practical collection of tips and tricks for optimizing log-on speed and usability when using mandatory and default user profiles. These tips are useful regardless of whether AppSense products are being used, so it’s a great opportunity for attendees to tap AppSense’s unmatched Windows profile knowledge. Throughout week, the AppSense team will also be manning the Demo Lab, so if you are attending BriForum Europe, be sure to stop by to say hello. It should be a great week! Just a quick note to say thank you to all of the AppSense IT Staff who helped make our recent Manhattan office move a smooth and seamless process. IT are often the unsung heroes within an organization, as for the most part they sit silently ensuring systems and processes run smoothly and any changes or upgrades are hidden from the user – in fact, we often only think of or contact the IT department when we as a user want something specific.. so in this case, thank you guys – you did a great job in moving all of our systems! 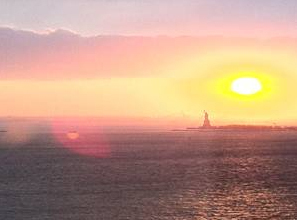 The new office is much bigger and has some great facilities, including this, the view from the office window everyday – we now get to watch the sun set over Liberty Island from the southern most building in the Manhattan Financial District!